IDX integrated website for Coldwell Banker Seaside Realty agent Lisa Strydom. OBXbeachbox.com the website is everything that an OBX Beach Box is – small, neat and tidy as well as open, airy, breezy and beautiful. This simple site includes all of the features of the big real estate sites as well. Visitors can search the MLS, save properties to a short-list, create a personal property organizer, sign up for daily email updates and more. 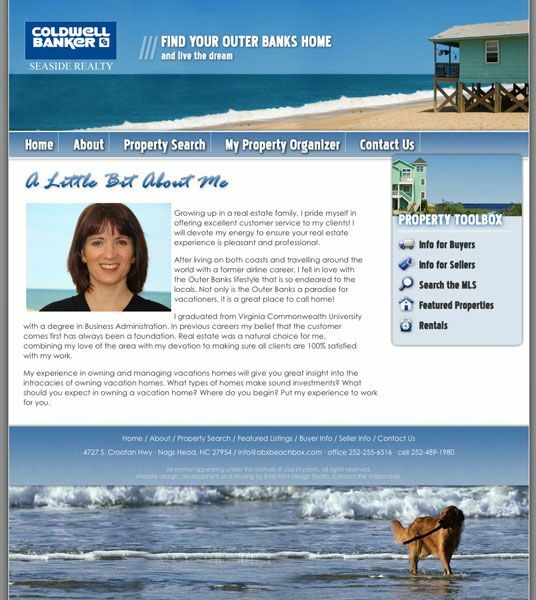 The site also includes a Featured Properties page comprised of a collection of custom hot sheets created by Lisa including her associate’s listings, local foreclosed and short sale properties, and more. Also featured are Lisa’s listings, and a collection of vacation rental properties.